The Flex Wheel is a revolutionary new way to grip, control and print with rigid or even the trickiest of flexible filaments with your exiting 3D printer. - Designed to be compatible with your existing 3D printer hardware and software. - 1.75 or 2.85 (3) mm configurations available. - Ideal for Bowden Cable set ups. Allowing you to upgrade and improve your printer. - Can be used in a Direct Drive configuration (check out requirements first). - Prints both rigid and truly flexible filament. - Improved retraction capabilities – don’t turn off retraction when printing flex, turn it up! The Flex Wheel is the first commercially available filament control system that has completely removed the 'hob' style gear from the system. This has opened up a whole new world of possibilities. How the Flex Wheel works can be found here. Based in Sydney - Australia - Shipping world wide. Kits from AUD $158 ($114 USD) - need additional stepper motor. Note: USD price is approximate. Test the limits of your printer with the Flex Wheel. That looks pretty cool! The weak point with my Bondtech extruder is the very short distance from the teeth output to the PTFE tube (still needed in direct setup). That is the small gap where the filament wants to bunch up if using a lot of force. How to you treat the transition for the flex wheel to the outlet tube? Also, what is the weight of that setup (with geared stepper)? Hi thanks for the question. The removal of all cavities and gaps (no matter how small) coupled with the ability to increase the driving force applied to the filament were the original inspiration for the design. 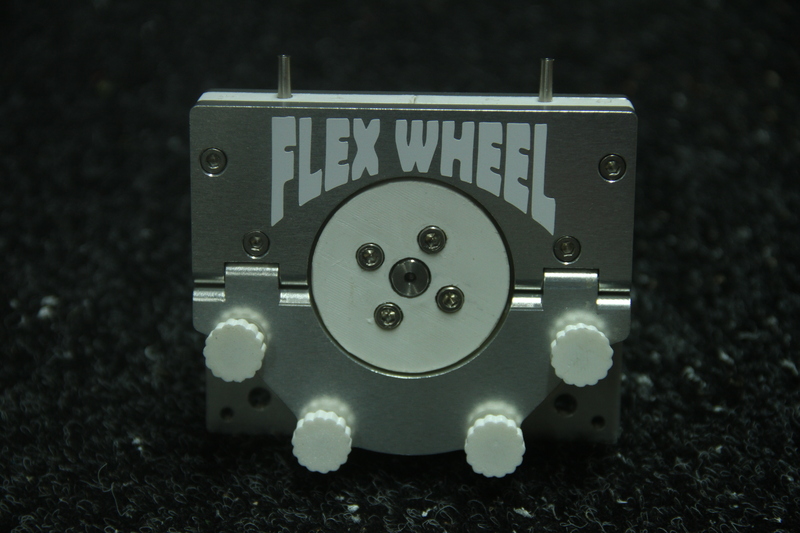 The Flex Wheel has a 60 mm diameter (approx) drive wheel which has 2 x pre shaped flanges that envelope the print filament, these flanges are compressed against the filament by series of small bearings located on a hinged plate. These bearings in combination with the flanges spread the driving force over a large area (result no localiced high pressure point or filament deformation). When compressed the flexible flanges completely surround the filament thus eliminating the existence of any gaps. Once the filament is travelling around the 180 degree arc inside the Flex Wheel the trick is to then get it back out !!! As the drive system produces an enormous amount of force this has not been an easy task. To achieve this I developed (after many reiterations) a filament guide block which contains a high precision stainless steel tube with an outside diameter which has been milled in multiple steps. One end sits snugly inside the Flex Wheel flanges, the other you can see protruding from the unit on the pic 4. The bearings and an additional slide clamp keep the flanges tight against the filament right up until the last moment when it enters the tube - The flanges being flexible they easily flow over the tube and move out of the way. The following assembly guide may help to explain the design in more detail. The Flex Wheel / Filament guide / bearings etc. are mounted on a high quality milled aluminum base and top plates with the quality precision geared stepper the overall weight is a touch over 900 grams - so not light. It is definitely the ultimate filament control system for Bowden set ups and I have switched all my printers to Bowden (even when printing 1.75 mm flex!). It can be used in direct drive situations, where the hot end is positioned and slides over the outlet tube and the Flex Wheel unit mounted upside down - I have used this set up to print ultra flexible filament (46A) video demonstration Printing 46 A shore hardness To be used in this configuration there are some factors to be considered - the weight being one of them / hot end offset from center and mounting position on x axis rails, however these can be overcome. Any other question help to provide further details. Edited 2 time(s). Last edit at 12/13/2018 02:08AM by Arnold Lane 1000.